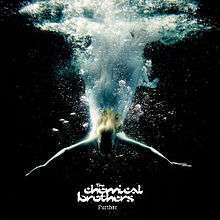 Further is the seventh studio album by The Chemical Brothers, released on 14 June 2010. The album title and release date were announced on the band's official website on 30 March 2010. All 8 tracks from the album are accompanied by corresponding films, made specifically to match them, by Adam Smith and Marcus Lyal. The main character of the films is portrayed by actress Romola Garai. The woman on the album cover is Jenny Godding, who also body doubled for the underwater portions of the music videos. The album, along with its visuals, was released as a DVD, as an iTunes LP, and as an iTunes Pass feature in US only. As a part of the iTunes Pass program, those who purchased it received an unreleased track, named "Pourquoi", on 29 June 2010. The standard edition was released on CD, containing just the eight-track album. Further is their first album not to feature any guest collaborations, a common occurrence in previous albums. While this is true, Stephanie Dosen provided the vocals for "Snow", "Another World" and "K+D+B". These are guest appearances, including Theremin performances by Bruce Woolley, but they do not count as collaborations since The Chemical Brothers did not work with the artists when writing the songs. Tom Rowlands sang himself on certain tracks. The album was the duo's first on Parlophone, ending fourteen years of releases on Virgin, although both labels are owned by EMI. Although it charted in many other countries, the album was excluded from the UK charts because British chart regulations forbid prizes being used as enticements to buy albums, and all formats of Further included a competition to win an iPad. In the United States, the album debuted at No. 63 on Billboard 200, No. 3 on Top Dance/Electronic Albums, and No. 15 on Top Rock Albums, selling 7,000 copies in its first week. The album has sold 40,000 copies in the United States as of June 2015. Further was nominated for Best Electronic/Dance Album at the 2011 Grammy Awards, but lost to La Roux's self-titled debut album. A number of its tracks were used in the media. The bonus track "Don't Think" was featured in the 2010 film Black Swan, in an altered form. The track "Dissolve" was featured as a playlist on the 2012 video game Lumines Electronic Symphony. The track "Snow" was featured in the 2015 film "American Ultra". As with all other albums by The Chemical Brothers, many of the tracks segue into the next. Escape Velocity, K+D+B and Wonders of the Deep are the only tracks on Swoon that end with silence. "Escape Velocity" was released on 12 April 2010 as a vinyl-only single. It did not chart in the UK charts. "Swoon" was released on 9 June 2010. It reached #85 in the UK charts. "Another World" was released as download on 16 August 2010. Also available as downloads are "Swoon" (Boys Noize Summer Remix), "Swoon" (Lindstrøm and Prins Thomas Remix) and "Horse Power" (Popof Remix). "Horse Power" was released in 2010 as a Promo DJ Single. It did not chart in the UK charts. ↑ "Further Reviews, Ratings, Credits, and More at Metacritic". Metacritic. Retrieved 27 May 2012. ↑ Bush, John. "Review: Further". Allmusic. Retrieved 24 June 2010. ↑ Hoard, Christian (8 June 2010). "Further by The Chemical Brothers". Rolling Stone. Archived from the original on 18 July 2010. Retrieved 27 May 2012. ↑ "Drowned in Sound review". ↑ "The Chemical Brothers". NOW Toronto Magazine - Think Free. ↑ "TheChemicalBrothers.com - Further". 30 March 2010. Retrieved 2010-03-30. ↑ "Billboard 200: July 10, 2010". Billboard. ↑ "Dance/Electronic Albums: July 10, 2010". Billboard. ↑ "Rock Albums: July 10, 2010". Billboard. ↑ "Upcoming Releases". Hits Daily Double. HITS Digital Ventures. Archived from the original on 17 June 2015. ↑ "TheChemicalBrothers.com - So, A Track Listing Anyone?". 4 April 2010. Retrieved 2010-04-11. ↑ "Australiancharts.com – The Chemical Brothers – Further". Hung Medien. Retrieved 2014-09-10. ↑ Steffen Hung. "Austria Top 40 - Hitparade Österreich". austriancharts.at. Retrieved 2010-08-25. ↑ "Ultratop Belgian Charts". ultratop.be. Retrieved 2010-08-25. ↑ Steffen Hung. "Dutch charts portal". dutchcharts.nl. Retrieved 2010-08-25. ↑ Steffen Hung (2010-06-19). "Les charts français". lescharts.com. Retrieved 2010-08-25. ↑ ":: MTV | Album Top 50 KW 32 | charts". Mtv.de. 2010-07-30. Retrieved 2010-08-25. ↑ Steffen Hung. "Greek charts portal". greekcharts.com. Retrieved 2010-08-25. ↑ Steffen Hung. "New Zealand charts portal". charts.org.nz. Retrieved 2010-08-25. ↑ "Oficjalna lista sprzedaży :: OLIS - Official Retail Sales Chart". OLIS. 2010-06-20. Retrieved 2010-08-25. ↑ Steffen Hung. "Swedish Charts Portal". swedishcharts.com. Retrieved 2010-08-25. ↑ Steffen Hung. "Die Offizielle Schweizer Hitparade und Music Community". Hitparade.ch. Retrieved 2010-08-25. ↑ Steffen Hung. "Productores de Música de España". Hitparade.ch. Retrieved 2010-08-25. ↑ "The Chemical Brothers – Chart history" Billboard 200 for The Chemical Brothers. ↑ "The Chemical Brothers – Chart history" Billboard Top Alternative Albums for The Chemical Brothers. ↑ "The Chemical Brothers – Chart history" Billboard Dance/Electronic Albums for The Chemical Brothers. ↑ "The Chemical Brothers – Chart history" Billboard Top Rock Albums for The Chemical Brothers. ↑ "The Chemical Brothers – Chart history" Billboard Top Tastemaker Albums for The Chemical Brothers.